ABIM policy is ruthless and harsh. When you sign an online take-it-or-leave-it contract with them your digital signature opens a candidate or diplomate up to criminal and civil prosecution. I believe past wording was focused more on threatening one with civil prosecution for anything they deemed to be irregular behavior. Now they seem to put criminal prosecution in the forefront. And it appears their judgement is final on more matters. This is one heck of an unfriendly corporation going for the money and political power. What stands out about this 80+ year old grumpy and haughty medical board is that it operates as if it suffered from dementia regarding the quality, voluntary spirit, and charitable aspects that used to be their sole corporate mission. They seem to have forgotten all about the lifetime certification with their latest reinterpretation of what lifelong learning is. Old misers counting the dollars hiring advertising firm/lobbyists/wall street bankers/political operatives to fill the executive ranks. Anybody other than clinical physicians have taken over and usurped power. The public and professional judgment be damned is their new motto. Wall Street and K Street were appointed to manage the ABMS' quality assurance portfolio with their pipeline of new MOC products and services. The goalposts have been moved so many times it's hard to follow this shell game. Why even try anymore. The whole meaning of certification has fallen by the wayside and devoured by private and public money vultures. Board certification has been rendered worthless by wreckless, abusive and greedy behavior of the entire ABMS. The flagship is undoubtedly the worst - skull and bones pirates ravaging the profession and the public, with ABIM flagship flying the "jolly roger". The ABIM website is a digital veneer. Underneath it's a collection agency sending out summons for money with an annual greeting threatening to take you paycheck and ruin your reputation. The theat to the profession and the public is real. A tema of dirty lawyers is there to back them up. I wonder if anyone could see objectively that the entire ABIM is just a bubble flitting through the air ready to pop at any moment. It's policies are comprised of mere puffs of air. Does a bubble have authority to take your money, threaten your livelihood or abiliity to be paid? If the bubble comes near in a draft just blow a little, it will move away; or if you blow a little harder it will pop. According to the laws of the universe this would be true. But the bubble along with its cronies have become a busy bodies creating evil conditions with its puffs of air in the ears of its partners and corporate boards. What the ABMS does is illegal and it is time for the laws of the land to be enforced. It is time for strong protective state legislation to be enacted to protect the public and the profession until the federal government investigates and prosecutes the bubbles and their corrupt partners. Time for this bubble called ABIM/ABMS and all the other medical boards to be popped. What has not changed at the ABIM stands out. The corruption and hubris. We see no sanctions, suspensions or certifications revoked of the elites who run/ran the flim-flam show. No press releases have gone out about those pseudo physicians like Christine Cassel, Richard Baron, Eric Holmboe, Bob Wachter, Adam Singer, Carmen Puliafito, and so many others like them within the ranks of the ABMS and ACGME who trangressed laws, violated ethics and behaved in manners beneath what the public would expect from medical professionals. We do not have to recount the ABIM/ABMS offenses. The ABMS/ACGME perps and all those hundreds, thousands and millions violated by them have the scorecards in hand. I wish I could say I saw the difference as clearly as you did. All I saw was a thin veneer of camouflage using internet optics and graphics mimicking a Facebook page. This is an organization that is desperately clinging to a failed business model. Take private dollars from physicians; make their lives complicated and burdensome; lie, cheat, steal and confuse the American Taxpayer; steal money from housestaff and fellows; encase ABIM leaders in Class A downtown Philadelphia real estate; hope no one notices all the money and abuse of hard working physicians. This is just the beginning. Civil lawsuits. Class action lawsuits. State anti MOC statutory charges. Federal tax fraud charges. Anti Trust per se lawsuits. This is a war. A war between the moral and the amoral. Between those who cherish American Medicine and will defend its ethical contract to the bitter end and those who use their peers to fund their Cayman Island retirement fund. Between those who shake with white hot fury by the very thought of all the wasted money and those who see nothing wrong with Mercedes Limo rides and Swag Bags at the Four Seasons retreat. And all the gurus at the ABMS can do is turn a blind eye. Many of us doubt the DOJ will. All major exectuives at the ABIM receive kickbacks from the ABIM Foundation. This is a major conflict of interest as any research conducted by either party is tainted not only with money but with employment bias. The payouts are obscene. Look at the lineup of the top 12 executives at the ABIM and their financial disclosures. The most striking thing other than the fact that the ABIM used to be comprised of medical professionals that volunteered their time for free, is the fact that ABIM does not list all the conflicts that an executive reports. why is that? They even state so, but when you inquire they ignore your emails. They will not put you through to any of the executives for inquiry. Total hypocrisy and cover-up of corruption is the rule and policy at the ABIM. ABIM disclosures do not mention that the Chief Medical Officer does not even live in Philadelphia but chooses to live close to his old employer PriceWaterhouseCoopers in New York. Why is that and how can the ABIM expect to run an organization such as the ABIM when the second in command does not even work there? Chief Medical Officer indeed? He is not a doctor at all. He is a Wall Street merger and acquisition advisor for hospitals, clinics and insurance plans. How deceptive is that? Someone had it right about the ABIM being a conduit for the healthcare industry and special interests to control their professional workforce by load them up with useless tasks, financial burdens, stress that does not go away and the intentionally and maliciously fill them with fear. Both highly politically active individuals Biemiller and Cassel worked together in the Phildelphia City government, which does not have the cleanest track record. No explanation is given about the ongoing relationship with Biemiller and Cassel with other political powerhouses in the state of Pennsylvania. Also Baron and the VP of communications do not explain why Judi Cassel, who has no testing or assessment background/no medical background was given the task to be chief and such a key position working on medical assessments. Cassel is also director of human resources and enforcer of ethics policies. Isn't that bizarre/odd sounding? What about the ABIM's ongoing ethics scandals and continuous coverups regarding the ABIM CEO's violatory acts agains physicians and board review courses? What power does a subordinate to Richard Baron have to clean up the ethics at the ABIM when Dr. Baron is at the center of scandal. Why is he even still allowed to run the corporation? Baron is not only a highly conflicted individual responsible for colluding with the NCQA to ensure the MOC gravy train and certification revenues remain steady by assisting in getting MOC and ABMS certification mandated by hospitals and insurers. Dr. Baron is a violator of human rights and civil liberties. His track record as a go to man for legal teams working to crush ABMS competition and use strongman techniques to violate physicians rights with threats, media releases and legal intimidation makes him not only conflicted but unfit for the job professionally and morally. The "new" ABIM never disclosed the privacy/constitutional rights hitman/felon Ben Mannes, their so-called "director of the office of investigations." Hired in 2008, such an important position and injurious person was never disclosed to physicians. Thousands were directly harmed by Dr. Baron and his goon squads, even after the departure of the egregiously conflicted Christine Cassel the former CEO in 2013. Baron oversaw the persecution of Dr. Salas Rushford for purely malicious reasons to continue the strong arming of physicians, destroying their rights and privacy. All the attention that FaceBook is getting over selling off clients's personal data for political/financial gain is being investigated, and so should the ABMS vicious personal attacks on privacy and wholesale slaughter of their constitutional rights. Physicians must come to grips with the fact that the ABIM and ABMS medical boards have devolved into corporate marauders. Surely they and the public must see what unethical CEO's like Rich Baron have done. Doctors have been stabbed in the back by so-called colleagues like Cassel and Baron using the ABIM as a political/financial machine in a highly partisan and monetized thrust to undermine the last vestiges of physician autonomy and private ownership in medicine. Pushing their model of healthcare onto the world by deception and manipulative political power. There has been no congressional investigation of the power that the ABIM and ABMS and their partners wield over physicians (illegally) through their monopolistic restraint of trade, social engineering, healthcare reforms and regulatory capture, which they lobbied for and funded with physicians over-payments/price gouging. Why are physicians and the public not screaming to their representatives in Washington about the loss of a physician's right to work and a patient's right to care. MOC is an instrument of harm to the health system, its professionals and is injurious to patients in the extreme who need access to care. Rich Baron and his financial and political disciples claim the ABIM receives no health industry money. Don't believe a word of it or anything about their mock conflicts of interest policies. Past history shows that the executives and board members have had tremendous payouts such as Chris Cassel from the health industry in return for political and financial favors. ABIM, under the direction of Cassel poured millions annually into Cecity, while she was on the board of directors of the acquiring company Premier, Inc.
Cassel received "highly conflicted money" from Prmier, Inc, and Kaiser Health Plans, while she stole from the Foundation hundreds of thousands more in so-called double duty "executive compensations". She served as healthcare reform advisor to the POTUS, while she secured boons for her friends. Cassel has so much influence a the Robert Wood Johnson Foundation they consider her a founding member. In fact, Cassel appointed the current CEO of RWJF. That's why we see so much money flowing into the ABMIM Foundation MOC research, Choosing Wisely campaign and on and on. Cassel, with her cartel-like thought processes even openly states she will not forget her friends, and then arranged for moneys to be procured, job appointments, committee assignments and oodles of grants written. Cassel and Baron, along with many other executives literally robbed the ABIM Foundation, using it as a personal piggy bank as Bob Wachter recounted in his Wiley/Hospitalist blogsite, which has been pulled from publication after the disgraced former ABIM board chairman was exposed taking his share of corporate healthcare money. Wachter did this on the side in return for personal, financial and political favors. Wachter was a chief coverup/spin doctor for himself and his cronies - many of whom he worked with trying to "absolve" them of guilt because he was deep in financial relationships himself. Reseaerch shows that many of Wachters partners were part of the same quality assurance cartel and industries in the midst of scandals involving kickbacks and safety issues of their own - companies/individuals in trouble with or indicted by the DOJ for kickbacks or fraud. The current ABIM executives are involved in MOC corruption and the bulk of their time is spent on putting a layer of fresh spin and bricks up to prevent exposure of the restraint of trade and the Ponzi schemes they propagate and maintain on a daily basis. Their kickbacks from the Foundation, like the many other executives before them, don't talk about the payouts from the Foundation. If they are called out about it they say it is industry standard to rob Foundations blind, while they milk the revenues from MOC and certification to the point that the testing corporation is run on a shoe-string or at a tremendous deficit. When ABIM execs take money from the Foundation, they further justify it all by telling themselves that they all pad their incomes, because the siphoning of funds has been going on for so long it is a tradition. Executives take money from the Foundation because nobody stops their greedy hands from dipping in to the non-profit easy money jar. It is for them as easy as stealing candy from a child. All current executives holding key positions receive kickbacks from the ABIM Foundation and rely on MOC revenue streams to fund their obscene compensatory packages, retirement/benefits contracts, along with the CEO's deferred accounts involving offshoring of profits. Part of these excess profits from overcharges to physicians are from MOC revenues totaling in the millions of dollars invested in the Cayman Islands (British protectorate) and Ireland (favorable tax laws and deferred tax status granted to fund managers) where they receive significant tax boons and privacy/confidentiality of investments/investors. Offshoring of investments circumvents US tax laws. ABIM's investment fund managers are not required to file with the Securities and Exchange Commission for transparency and government scrutiny. Such investment/retirement holdings can be virtually immune from creditors/taxation in the event of corporate bankruptcy. Rich Baron, executives, board directors and officers, the cunning CFO along with their army of tax attorneys should be congratulated by their cronies who do the same shady things. All at the ACGME/ABMS cartel have worked very hard to hide profits, maximize tax advantages and protect their personal nest eggs no matter what they do to harm the public, the profession, or the financial viability of the ABIM and murky Foundation - a supportive organization with its millions upon millions of doubly laundered dollars in profits hidden and invested for years in risky equities and high yield junk before anybody even caught wind of it. What do you mean Senator? What training are you referring to? Could you repeat the question, Senator? I am not aware of any data scraping Senator? Full disclosure. 85% of the House Energy and Commerce Committee members interrogating their volunteer CEO, Mr. Zuckerberg, received donations from FaceBook and/or owned substantial shares in the company. The new CEO of the ABMS, Richard Hawkins, allegedly wrote an opinion piece recently in Fortune Magazine - a rebuttal to an anti-MOC piece written by the PPA. It is unlikely that the "newbee" Hawkins wrote the opinion piece himself as it reveals the classic double-think and newspeak that only ABMS risk managers and staff writers could come up with after years of experience in the lucrative art of fact manipulation and propaganda techniques. Can the new CEO of the ABMS, Richard Hawkins, explain how and why a non-physician was appointed to the American Board of Preventive Medicine? They chose a Burger King franchise operator/attorney with a bad health department track record and an even worse record for safety and preventing injury and death in his franchises. He has no degree in Public Health and not background in healthcare whatsoever. What are they thinking? How did the board of directors and the chairperson of ABPM allow this disgrace to happen and how could they even endorse Chris Ondrula? The public and profession are outraged about this. The diplomates are not happy by this move that took place during the lame duck month of December as Nora was leaving her position. Is this yet another pathetic example of Private Equity and PE money buying their way in and contolling the ABMS and the medical boards? When is the graft going to end and get cleaned up? How could Dr. Krousel-Wood put her reputation at risk like this? Did she think that nobody would see the impropriety and blatant conflicts of interest of Mr. Ondrula. The ABPM is not a cheap run donwn burger restauraunt franchise to be bought and sold by Private Equity money or the healthcare industry. What is the game? Please explain Dr. Hawkins. Has the American Board of Medical Specialties with its files, data collection and analytics platforms not morphed into what Amy Goodman of Democracy Now calls the "inelligence industrial complex"? Data collection, the speed at which it is acquired, the sheer amount of it, and the abuse of that personal data has "progressed" immensely since the AMA first formed their secret "bureau of investigation" to control the flow of trade in medicine in the early 20th century. This was done under the auspices of science and the scientific method in order to "protect the public." In the 1920's the AAMC in collaboration with medical schools started keeping files on students presumbably to weed out those who would be unfit to utilize the limited educational resources available, i.e., medical school slots and training program positions. They collected the files in the name of "scientific research". But it was really intelligence gathering, data collection for purposes other than science, and that information on students and housestaff would soon be abused and find its way into the hands of many other actors who were not interested in the selfless pursuit of science. The data was not private and was used by schools and the AAMC in collaboration with corporate and government entities. This is the same case now as it was then only the situation has gotten worse. In the 1930's we see medical boards slowing being created - most of them over the span of a couple of decades. The AMA and ACP created organizations like the ABIM (1936). That organization is almost unrecognizable today in its present form compared to the original. 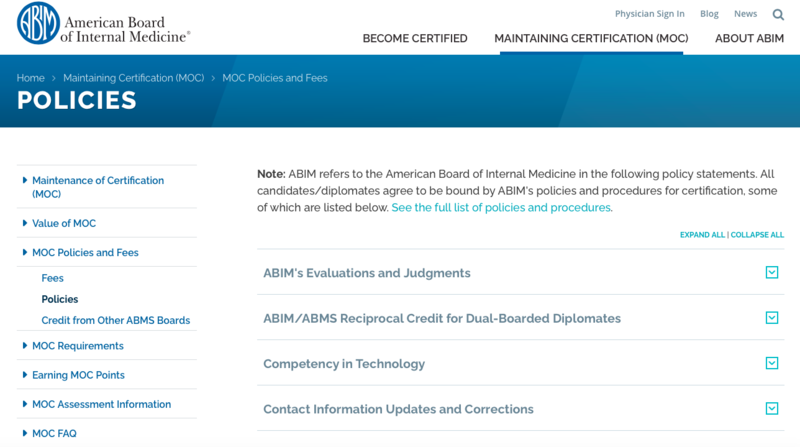 The author of this blog has done a great deal to reveal hidden things about the ABIM and ABMS medical boards as we know them today - many uncomfortable and unpleasant truths that we did not know. In an age of information, it is amazing how little of the truth we receive as we see the flow of facts being controlled by six large media conglomerates. The worsening of the situation for docs came with the ending of lifelong certification. Certification is no longer voluntary. This change from being totally voluntary to being mandated by colluding industry partners such as the NCQA and ACGME was wrong. MOC has tipped the scales of justice. Physicians are no longer in control of their lives to the degree that they have no voice and no vote in the matter. 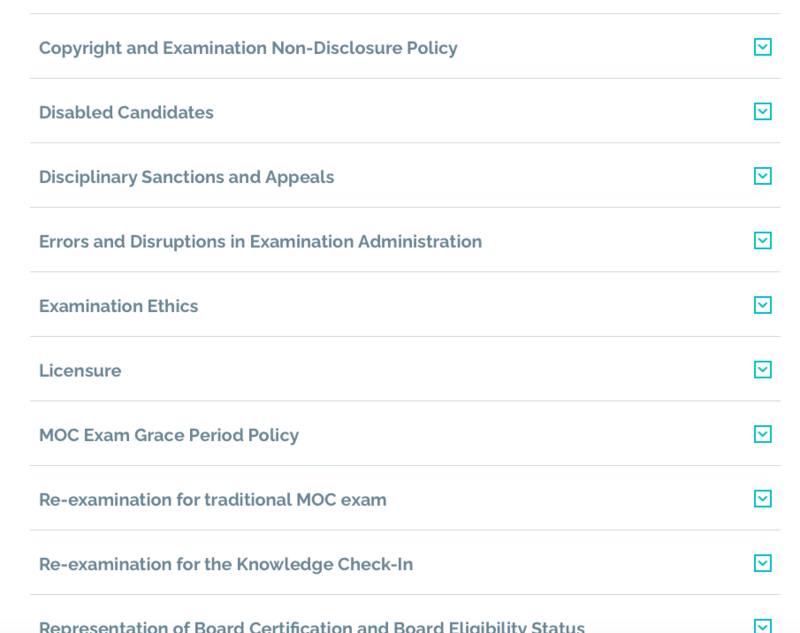 Docs can't just say no to the certification boards. They will lose their jobs and ability to get paid. In the past it was more just and honorable as one could choose to certify or not. Now all of the certifications are in jeopardy, because the ABMS has gotten greedy. They are trying to juggle too much. In their two hands they hold certification (for life) and in the other hand they clutch MOC, because of the money and control it brings to them and others. Nothing to do wth public safety. In fact it is just the opposite. Moc cheats everyone. The executives and officers of the medical boards now find it difficult to speak honestly. The bias of employment and money has replaced science. In the beginning their was no money for serving on the medical boards and there were checks and balances. There were no executives skimming big revenues. They boards were only led by directors and a few officers. Now the invented position of executive CEO/President has distorted everything. They and their army of press agents/advertisers/Wall Street managers invent so many stories about MOC and it is painful for everyone who watches this; and doubly painful if your livelihood depends on participation in an unproven metric. It is triply lamentable when one has to eat the ABMS' harmful insistence on that which is known to discriminate against physicians' right to work and dampens the ability focus on the knoweldge one needs. Plus MOC only interferes with a patient's right to care. MOC needs to end and we need to get an accurate picture of what the truth is about these medical specialty societies, which now have branches and reprensentation around the globe in countries whose governments commit the same dicattorial mistakes on its populaces as the ABMS medical boards do here in America. It is also strange that most if not all of these foreign operations of the ABMS are in countries who are the top arms buyers who use these weapons against helpless civilians. It is not surprising that many of these ABMS affiliates are also some of the biggest offenders of human rights. These latter truths can reveal agreat deal about the ethics of the ABMS and 24 medical boards along with their international branches and partners. It tells us a great deal about who they really are. They are not servants of a charitable organization, but something much different today.